White tea comes from the leaves of the Camellia sinensis plant, the same one that produces green, black and oolong teas. Like green tea, white tea leaves are minimally processed, but unlike green tea, only the youngest leaves and buds of the plant are used. Silver needle white tea consists of only the buds of the plant and is very rare, as it is harvested only two days of the year. Like all white teas, it is high in antioxidants and can potentially provide protection against a host of conditions. White tea and green tea have similar amounts of catechins, a class of antioxidants, according to a study published in 2010 in the "Journal of Food Science." White tea, however, had lower overall antioxidant capacity than green tea, leading researchers to surmise that white tea may have a lower level of antioxidants unrelated to catechins. 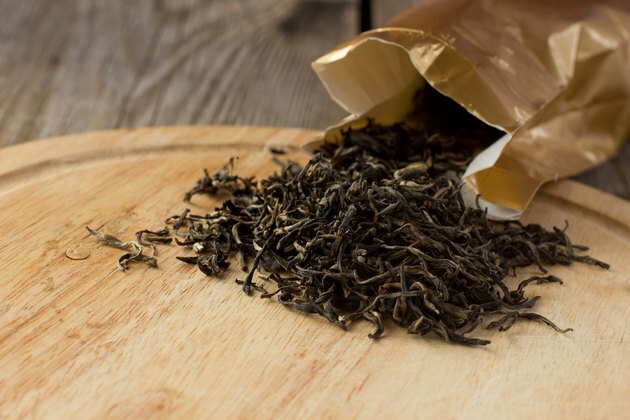 So if you've been wanting to drink green tea for health reasons but don't like the strong flavor, white tea may be an antioxidant-rich alternative. Brewed white tea may help lower blood glucose levels, potentially helping people suffering from diabetes. An animal study that was published in 2011 in "Phytomedicine" investigated the effects of white tea on diabetes symptoms. In this four-week study, researchers found that consuming a water extract of white tea leaves led to lower blood glucose levels in the diabetic test subjects. Lower total cholesterol and low-density lipoprotein -- the "bad cholesterol" -- were also observed. Researchers concluded that white tea extract may help reduce or possibly even prevent the symptoms of diabetes, although human study is still needed. White tea, like green and black teas, can be purchased in a loose-leaf or tea bag form in specialty tea stores, health food stores, Asian grocers and some supermarkets. White tea is best brewed with water that is between 180 and 185 degrees Fahrenheit to avoid scalding the leaves. Use about 2 tablespoons of dried tea leaves for every 8 ounces of water. Because silver needle teas are made from the buds only, you need to steep it for five to seven minutes to bring out the full flavor of the tea.